Each year on November 1 and 2, people around the world celebrate the Day of the Dead—sometimes called All Souls Day or Día de los Muertos in Spanish—to remember and honor children and adults who have died. To date, since 2003, 165 people have died in immigration detention, including ten in Fiscal Year 2016 (ending September 30) and one person since October 1. 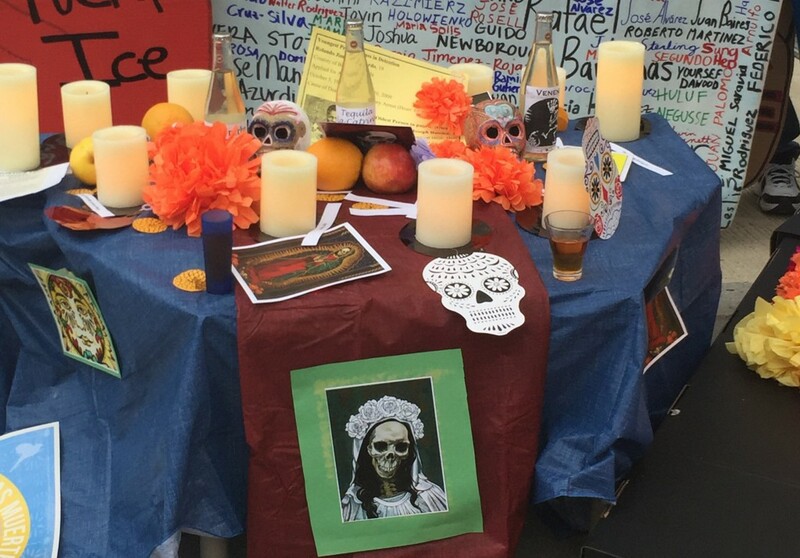 Several groups have organized events around the country to commemorate the many who have died in immigration detention, and to call attention to their tragic deaths. On Tuesday in Washington, D.C., dozens of people marched to Immigration and Customs Enforcement (ICE) headquarters to demand investigations into the 11 in-custody deaths since October 1, 2015. Protesters also demanded to close the LaSalle Detention Facility in New Orleans, LA where three of the deaths occurred. Research has shown that the medical care in detention facilities is woefully inadequate and has had a significant role in detainee deaths. The report Fatal Neglect: How ICE Ignores Death in Detention, released earlier this year examined “death reviews” released by Immigration Customs Enforcement (ICE) through a Freedom of Information (FOIA) request, finding that ICE’s failure to comply with medical standards contributed to at least half of the in-custody deaths between 2010 and mid-2012 for which ICE produced documentation. In a Human Rights Watch report released in July analyzing 18 “death reviews” conducted by the Office of Detention Oversight (ODO) for deaths that occurred May 2012 through June 2015, independent experts found that in nearly half of the cases substandard medical care and violations of detention standards contributed to the detainee’s death. Across the board, these failures to provide adequate medical care and oversight put other detainees at risk. Violations of detention and medical standards, as well as the broader inadequacies in immigration detention, have been scrutinized repeatedly this year. In the spring, the Office of the Inspector General (OIG) began conducting surprise inspections of detention facilities around the country. Privately owned or operated facilities in particular have been heavily criticized. The Department of Homeland Security (DHS) is currently reviewing its use of private detention centers, following the Department of Justice’s (DOJ) announcement that it would begin scaling back and eventually end its use of private prisons after officials determined such facilities are both less safe and less effective at providing correctional services than those run by the government. Following DOJ’s announcement, the Cibola County facility, which is operated by the largest private prison company Corrections Corporation of America (now rebranded as CoreCivic), was slated to be closed. Yet just this week, ICE finalized a new contract with CoreCivic to keep the facility open as an immigration detention center. Given that Cibola was one of the worst medical care providers among the 13 private facilities contracted by DOJ, and that three deaths have been linked to such care, the government’s decision to keep the facility open with a different contract raises serious questions. Moreover, the government is holding a record number of people in immigration detention—over 40,000—and is still looking for more bed space. This is deeply concerning in the context of medical standards and care—a growing population in facilities that have already been failing to meet the agency’s obligations. The failure of ICE to adhere to its own medical standards, and the ineffective oversight mechanisms in place to enforce such standards, has dire consequences for detainees. Today’s demonstrations remind us that lives are at stake in immigration detention, and that more and better oversight is needed to ensure those in ICE custody receive proper care and medical attention. Above all, the government should reduce its reliance on unnecessary detention, instead utilizing alternatives to detention. Making such changes will go a long way in preventing needless deaths.